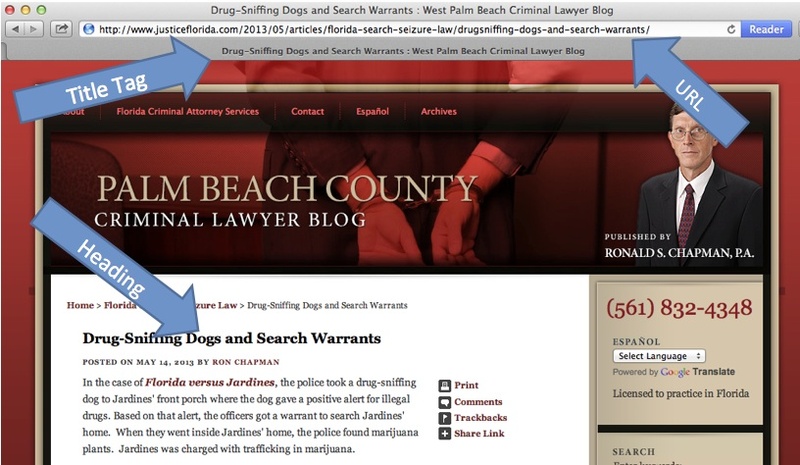 Looking at the screenshot below, it is very clear to any human that this is a blog post covering Drug Sniffing Dogs and Search Warrants. Unfortunately, the underlying code does a very poor job of telling computers what the article is about – leading to this page (and all the other pages on this site) performing extremely poorly in search. Here’s why . . . Unfortunately, when this page was created, the URL ends with “drugsniffing-dogs-and-search-warrants”. 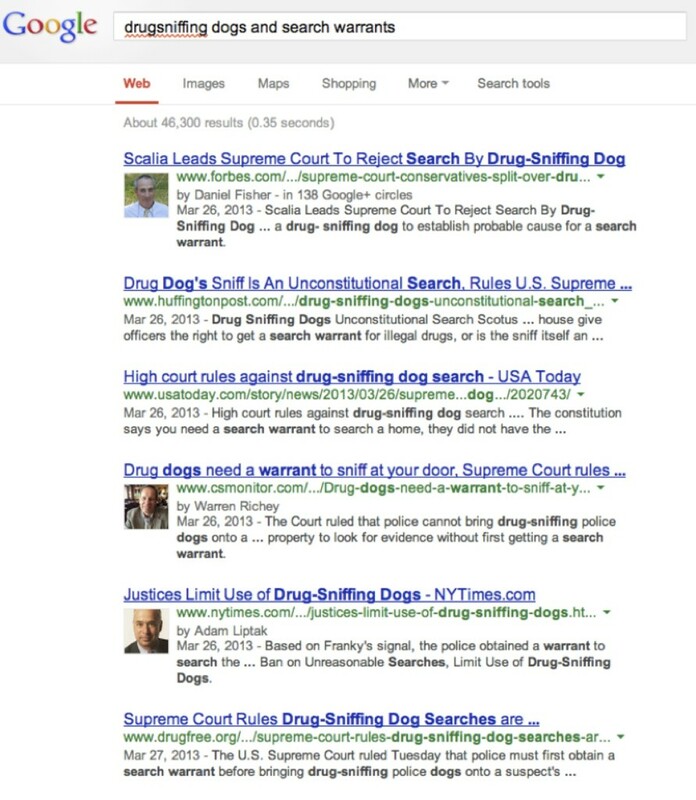 The failure to separate “drug” and “sniffing” in the URL optimizes the page for the never searched for word “drugsniffing”. In fact, the primary heading, H1, tells search engines that this page is about: “Palm Beach County Criminal & DUI Lawyer : Criminal & DUI Defense Attorney in West Palm Beach & Palm Beach | Criminal Attorney: DUI, Assault & Battery, Felonies”. What a mouthful – that’s some ugly keyword stuffing and is only very tangentially related to drug sniffing dogs and search warrants. Note above that the H2 and H3 above contain generic, templated content as well.. Predictably, we find that every single page on this website uses the exact same, keyword stuffed, H1 – sending a strong signal to the search engines that every page on the site is about the exact same subject matter. Not surprisingly, even with an exact search for the page title including the misspelling, the attorney’s content fails to surface. I’ll bet dinner that his analytics also show zero inbound search traffic to this page. Generally, modern website and blogging platforms have most of these technical problems ironed out. You should never have to get your hands dirty in the code. But this example highlights the importance of having a modern, up to date platform. The justiceflorida.com site in this example is built on an outdated version of Movable Type. The simple obvious solution: a recent version of WordPress. You know where to look for the URL and the Title Tag – heading tags are a little more hidden, but not too hard to find in the source code. You can access the source code on a website by using the “view source” function in your web browser (usually under “view” or simply by right clicking on the page). Then search the page for “H1” and see if you have a unique description of the content of the page. These tags show up in pairs – so you should only have two H1s (as there should really only be one primary heading for a page); multiple H2s, H3s etc. are fine.